Before the hurricane came, I was a software engineer. I'd graduated with a bachelor's degree in graphic design and animation, but here in Puerto Rico there weren't many jobs in that field, so I taught myself how to code. When I began, I didn't even know how to make "hello world" appear. After a while, I was building full-blown apps. In May 2017, I had to quit my job—my employer stopped paying us, which left me little choice. I then started working full-time on my DIY project: a full-body 3D scanner. I built the scanner myself, and to this day it's probably the only one in Puerto Rico, or even Latin America. Then the 2017 hurricane season hit. My house was knocked off the grid for a week. I didn't even notice it at first because my house partly ran on solar power. After Hurricane Maria, though, I knew I had to push harder to keep the lights on. I started looking up information online and buying gear from Amazon. I researched how to build batteries and store energy—I even found examples from the Philippines and Africa. While I was putting things together, all around me people were suffering, and I was trying to teach them about solar energy. There are still tens of thousands of Puerto Ricans without power. Many of them are poor, often elderly, and they live in remote communities. Some have to choose between paying for power and paying for water. At that time, I found Jehu Garcia's YouTube channel. He's a California-based professional YouTuber who builds all kinds of contraptions based on batteries. He has a self-built Volkswagen electric van and a rebuilt Tesla Powerwall, which he did by himself. He mentioned Puerto Rico in an interview he did around then, and it just hit me—I knew we could do this. From there on out, things moved fast. I started building solar installations for people without energy, based on Jehu's instructions, and he called on his followers to donate equipment. He even came over to Puerto Rico to help. Essentially, we use trash to turn on the lights. We use recycled batteries from dead laptops and other electronic devices to build solar generators. Oftentimes people discard batteries even though they are still working; they simply have a circuit board that went bad. So we give them a second, third or even fourth life. They're adapted, attached to solar panels, and used to store the energy the panels generate. I've worked on 44 projects of various scales. In one of my latest, I worked with three amazing women who live on top of a mountain near Arecibo. To get there, you need to walk a dirt road next to a cliff. They don't have power, because of the location. I had to walk up that hill four times, but last week one of the women sent me a message saying that her little nephew is able to watch TV at their house. Right now, we are working together with Sirenas Taínas, an organization that helps poor people rebuild their houses. They go knocking on doors, and when they find people who are without electricity, they call us. 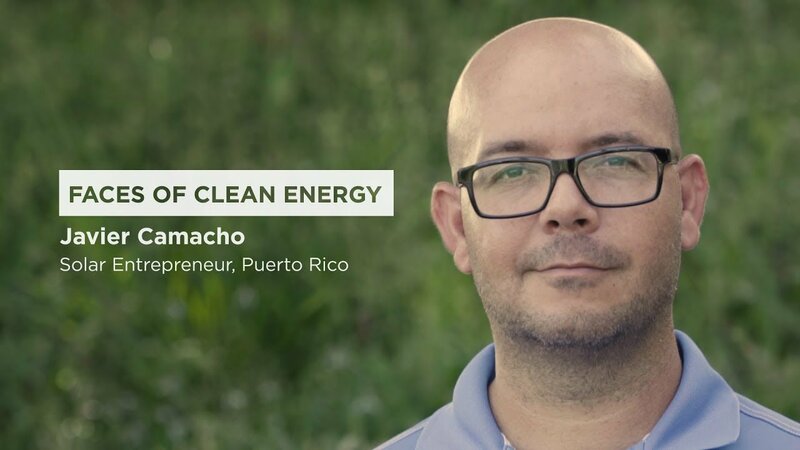 There are a lot of big companies coming to Puerto Rico now and investing in renewables. I love it, but I keep wondering if this is really a solution. They build their solar parks and windmills next to the coast and plug them into the centralized grid. But there are a lot of poor people who—certainly during a catastrophe—will not be able to rely on that grid. That's why I'm transitioning from donating solar installations to helping people make low-cost solar systems. I want to make sure they know how it works. We should not just be given fish; we need to learn how to fish. Puerto Rico is just a little dot, but around the world more than 1 billion live without electricity. The things we develop here have great potential for all those people. The Bible says to take care of your neighbor. If people actually did that, imagine what an awesome world we would live in. This article appeared in the July/August 2018 edition with the headline "Empowering Puerto Rico."